PLANET OF THE DOLLS: Adventure Boy! I got lucky and found two for a great price recently! These little guys aren't officially Finger Ding dolls, but they are also made by Remco,like the others I showed you,which are 'Finger Dings',and they share the same principal of using the child's fingers for legs. They have plastic heads,arms and torsos,but their legs are only empty tights until somebody puts their fingers in there. These guys are from 1970. Like the others I showed you,they are about 5" tall. This one is Adventure Boy with his Snowmobile. He definitely could have used it the day I took his photos. Since then we've had tons of rain,(Including the loudest rain storm I have ever heard: and I'm talking the actual rain, not thunder! There may have been hail mixed with the rain, but it was raining so hard I couldn't tell! ),and all the snow is gone. Here's how his box looked. (I don't have it.) He originally came with skis too. I really think these Finger Ding dolls over sold themselves: "There's never been anything like him! He's almost alive!" He's the one on the left in the two shot above. He has slightly lighter brown hair than the other one. The other one is Adventure Boy with his Skymobile. Mine is missing the decal from his chest. His hands are painted red,but I'm not sure they are supposed to be. We'll just pretend he's wearing gloves! 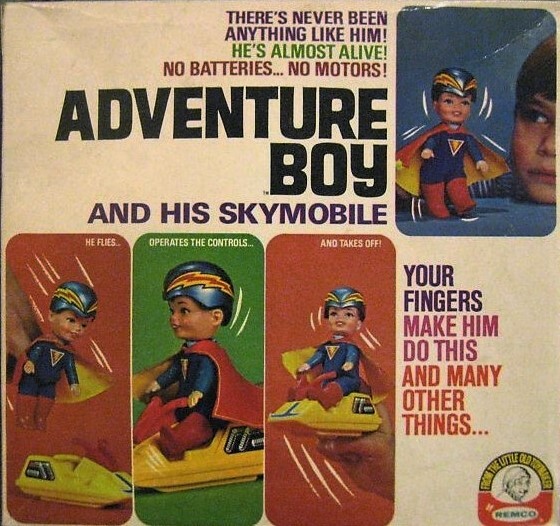 Skymobile Adventure Boy has a cape,and his helmet has lightening bolts. 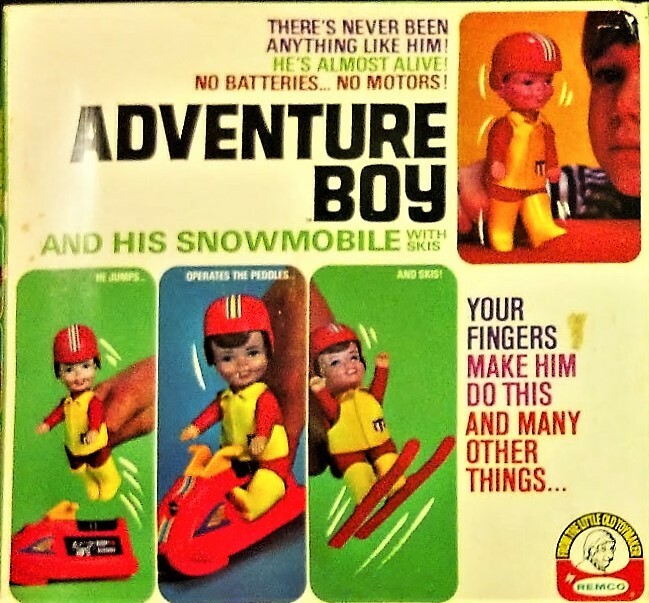 Snowmobile Adventure Boy has what looks like a baseball helmet,and an apron of some sort. Looks like he's ready to play Finger Paint Baseball! Not that I want to start some kind of dispute about who's the coolest. Ut oh. We have an Adventure Boy down! You know how I love boy dolls. These guys are really cute. I think I like them much better than the two girls you saw in my other post. Plus they have cool gear! He gets knocked down, but he gets up again. Plus Adventure Boy has something else I love on dolls: teeth! 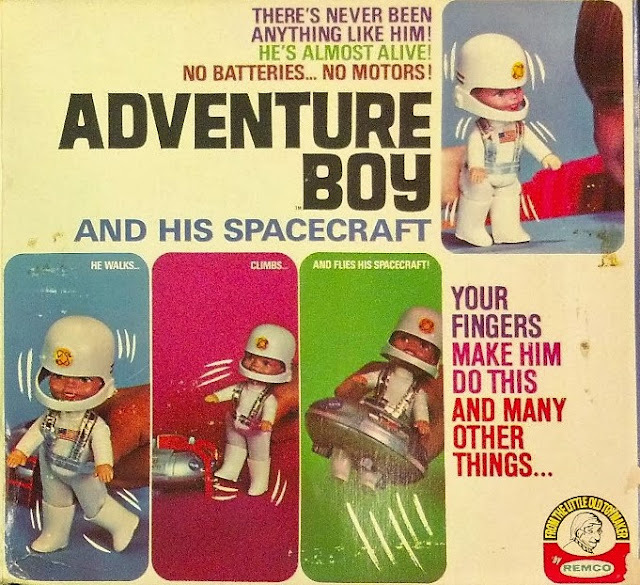 ...but the astronaut Boy is great. Of course, I'm a child from the moonwalk era. I wasn't very excited about it back then though. I remember the moon landing, and Mom and Dad making my sister and me watch it. We were bored, and complained and wanted to go upstairs and listen to Paul Revere and the Raiders! I think that must have been my big sister influencing me, because I am pretty sure I would have been awed by such a thing otherwise. It still awes me that anybody managed to do that. I told my kids about it when they were little. I think Fuzz was most impressed that they left a car on the moon. He used to look at the moon and say, "I can see the car."! So that's it for this post. See you soon. These are cute little boys, I've never ever seen or heard of them before! I can imagine they were fun for kids to put their fingers in the empty tights and make their legs move! LOL!